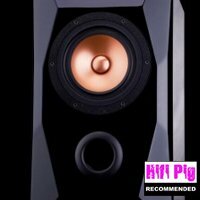 These are the big brothers to the standmount LFT-16a speakers recently reviewed in Hifi Pig. At just over 5 foot (1.6m) tall and weighing in at a fairly hefty 41Kg, these will be difficult to hide away in the corner or to sneak past your Significant Other! Once again they are quasi-ribbon hybrids, but with the LFT-8b the quasi-ribbon array is much larger and covers a larger proportion of the frequency spectrum, and a larger woofer cone and enclosure is used to handle the bass. As the listening sessions showed, though, it’s not just bigger helpings of the same sonic flavour but a rather different style of presentation. The most usual loudspeaker technology is based around a cone or dome made out of paper, plastic or metal with a coil of electrically conductive wire (the voice coil) attached, and with an adjacent magnet structure. An electrical signal is applied to the voice coil, this interacts with the magnetic field and the cone or dome moves in time with the signal variations. Make the signal variations the music signal, and music is the resulting sound created by the air movement. The problem here is to make the cone or dome stiff enough that it precisely follows the input electrical signal. The cone/dome material flexes; it has to, nothing is perfectly rigid. Strengthen the material to make it stiffer and you will most likely increase the mass, which reduces the responsiveness of the system and so reduces the resolution of the sound. Material and magnet type can be improved, generally at a cost and with the usual law of diminishing returns. Eminent Technology takes a different approach, at least as far as the midrange and treble parts of the audio spectrum are concerned. They use “magnetic planar” drive units for that. An electrically conductive aluminium track is etched onto a light Mylar film and is placed between an array of strong magnets. The audio signal is passed through the aluminium track, and the magnetic field so produced interacts with the magnets and causes the Mylar film to vibrate, producing the sound. 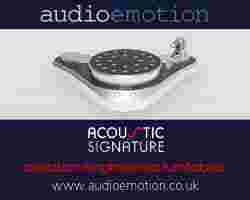 It’s the same kind of principle as electrostatic and ribbon speakers; a thin, lightweight diaphragm moving the air. The advantages are similar, too …. Low colouration, as little energy can be stored and released later. No need for boxy cabinetry, so another source of colouration is removed. High diaphragm ‘acceleration’ due to the low mass of the diaphragm, so resolution can be very high. Excellent high frequency extension, once again due to the low mass of the moving material. There is a lot going for the approach! The main disadvantage is that the excursion limit of the diaphragm is more restricted than for a conventional cone driver, in order to keep the driver within the linear region of the magnetic field, so less air is moved for the same driver area. This results in lower sound pressure levels and restricted bass extension. The way around this is to increase the diaphragm area – this of course increases the size of the speaker (full-range electrostatic and ribbon speakers can be very large!) and also increases the cost. A way of addressing this problem is to produce a hybrid speaker, with upper frequencies produced by the thin diaphragm, and a conventional ‘cone in a box’ producing the lower frequencies. That’s the approach that Eminent Technology use in their loudspeakers. Some manufacturers of hybrids use ribbons to replace conventional dome tweeters and so only produce high frequencies with the ribbon driver. Eminent Technology, though, use their quasi-ribbon drivers for both treble and midrange reproduction. 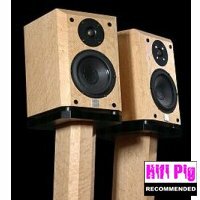 This is the same kind of approach that was used in the Infinity RS2.5 ribbon hybrid speakers previously reviewed in Hifi Pig. Established in the USA over 25 years ago, Eminent Technology have been quietly and successfully honing their product range. 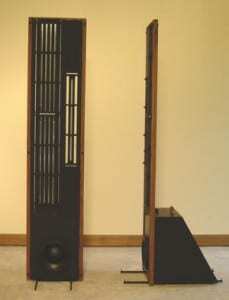 The two hybrid speakers intended for stereo use are imported into the UK by A&D Audio, based near Portsmouth. As well as these two speakers, Eminent Technology are well known for their long-established air-bearing tonearms, in fact that was their first product, and also the astonishing rotary subwoofer, it looks and works like an office fan! They also make a hybrid AV centre speaker. The LFT-8b ribbon hybrid speaker …. This is a three-way design that features a deliberately non-cubic sealed box (it has a steeply sloping rear panel) holding a 8 inch (20cm) cone woofer custom made by Eminent Technology themselves. The tall solid wood frame that towers above the bass cabinet encloses a 3.5 x 41 inch (9x103cm) midrange quasi-ribbon driver and alongside it a 0.25 x 18 inch (0.6x45cm) high frequency driver. Both drivers are open front and rear. The speakers are “handed”; the high frequency drivers are intended to be inboard of the midrange drivers. Each LFT-8b is 1.59m tall x 0.385m wide x 0.71m deep and weighs 41Kg / 90 lbs. Note that the depth measurement includes the 23cm of the projecting stabilising ‘feet’. The wooden panel trim is available in Oak, Walnut and Gloss Black. 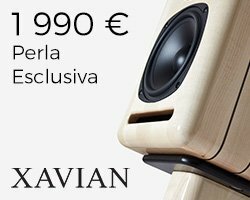 The speaker is finished to a good standard, although you don’t get sophisticated ‘high end’ looks and finish, but you don’t get the corresponding high end price tag, either! The mid-range panel of the LFT-8 speaker uses a low mass foil/Mylar diaphragm with aluminium conductor traces etched (like a circuit board) with high resolution to obtain a uniform driving force over the entire surface area of the diaphragm. The high frequency tweeter uses a thin, lightweight diaphragm. The midrange unit comes in at 180Hz, and the high frequency unit at 10KHz – so the latter is more of a super-tweeter equivalent than a tweeter. Recommended amplifier power is between 75 and 200 Watts. Efficiency is moderate to low, and specified at 84dB/W/m. You can modify the tweeter output level by small (3dB) amounts by changing the connections (simple screw attachments) at the rear of the front panel, on top of the bass cabinet. Personally I preferred the loudest of the 3 high frequency settings, but the driver comes in at a very high 10KHz, and the effect on the music is not great. I like the look of the speaker without the front covers on – but I guess not everyone will favour the rather retro-hitech appearance of the bare drivers. Black cloth grilles that cover the whole of the front and rear panel baffles are provided and are attachable by hook-and-loop fasteners to give a much simpler, cleaner look. Setup & Initial Impressions …. To start with, you need to get the positioning right. For the first couple of days of this review I was really struggling to get a sound I enjoyed. I read the manual, and took the advice that the optimal frequency response was on-axis and that the speakers are usually best heard with the listener on-axis. I shuffled the speakers around with that restriction in mind. Sadly, the imaging remained closed-in and the whole presentation was kind of subdued and lacking in the life and pizzaz of real music. Suddenly the whole presentation opened up, both spatially and dynamically. Hey, this is more like it! At last, a sound I could enjoy. Happily, this kind of positioning also gives a nicely wide ‘sweet spot’ – no head in a vice syndrome here. I’m not sure I’ve come across a speaker before which is so sensitive to toe-in angle. So what we now have here is a quite exciting speaker, which provides a satisfyingly large helping of the life and vibrancy of real music. A room-filling sound that really captures the feel of the recorded acoustic space. They take you to the musical event. Very nice indeed; so many speakers fall short in this regard. The LFT-8b justify their price and a place on your speaker short-list for that achievment alone. Comparisons with the smaller, stand-mount LFT-16a were interesting … and not quite always to the larger speakers’ advantage! Dynamics & Loudness Levels …. The larger speaker can move more air, and it does this in a well-controlled fashion. Everything is scaled-up accordingly. You are transported from the LFT-16a’s view of the musical event as seen from your living room to the LFT-8b’s view as seen from the music venue itself. With my 250wpc Parasound amp loudness levels weren’t restricted at all. These are big speakers capable of a big sound. Imaging was large scale and open, and nicely avoided any tendency to cling to the speakers. Image focus and depth were very good, the overall presentation being more toward the enveloping rather than pinpoint. A middle stalls or midway back in the arena perspective on the music, say. The smaller 16a provides a more restricted view in terms of imaging and tends to shallowness near each speaker. They also gave a rather more upfront perspective on the music. Quite deep and with good power and definition, the bass of the LFT-8b is deeper and fuller than the LFT-16a. The larger woofer cone and enclosure of the floorstander reap the expected benefits of extension and dynamic heft. So, excellent bass from both speakers, commensurate with their respective sizes. But you can get more bass, deeper and more powerful, from some other speakers. The Eminent Technology hybrids would not be my recommendation for techno-dance or dubstep fans, for example. Even the larger 8b doesn’t vibrate your chest cavity or pulsate your eyeballs sufficiently for some musical genres! But if ‘monster bass’ is lower on your priority list, then I doubt that the LFT-8b will disappoint; there is satisfying bass heft and depth to be had. Very good, but not great. The smaller LFT-16a speaker is a little more transparent and highly resolved in the mids and treble than the LFT-8b. Listening to solo lute sonatas by Silvius Weiss from the superb Naxos CD series, plucked string transients were a little smoothed over and rapid notes tended to run together a bit. The smaller LFT-16a did noticeably better in this regard, and my own reference speakers were a step up again from this. In fairness, the LFT-16a standmount is pretty exceptional in terms of midrange and treble resolution, and may well be a class-leader in this respect. The LFT-8b certainly lets you know what is going on, but there is more fine detail to be had from other speakers if this aspect of music reproduction is important to you. An obviously full-range sound, but I get the feeling that it’s a little rolled off at the highest frequencies, just a little lacking in top-end sparkle, a little polite. I found this both on-axis and with the speakers toed-out to optimise other aspects of the presentation. The midrange is fuller and doesn’t have the slight tonal starkness of the LFT-16a. Very nice! The transition from the quasi-ribbon midrange driver to the cone bass driver is not quite as seamless as with the LFT-16a standmount. A slightly different sonic character is evident. I very rapidly acclimatised to this, though. What you don’t get are the intrusive tonal colourations that are all too evident with many traditional “drivers in a wooden box”-type speakers. The Eminent Technology speakers are like a good electrostatic speaker in this regard – and it can be be very hard indeed to revert to traditional loudspeakers after hearing your music without these colourations! Music just sounds more natural without them. Personally I prefer to use these speakers in a system where other components are a bit on the bright/forward side. My Morgan Audio 500 valve pre-amp is a lean-mean detail machine, and suited the LFT-8b quite well. Whereas my Bent Audio NOH TVC passive pre-amp, which is a bit on the smooth and warm side, gave an overall slightly subdued sound with these speakers. They had a small smoothing effect on the sound – I prefered the sound of the speakers without the grilles on, but there is very little in it. A very fine speaker that I enjoyed a lot. Is it perfect? No … of course not. 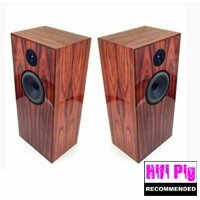 Bass is impressive and very enjoyable, but you can get deeper and more powerful speakers than these for similar sorts of money. Resolution is good, but there are higher rez speakers out there, including Eminent Technology’s own excellent LFT-16a standmounter. What you get with the LFT-8b is a decently full-range, dynamically impressive speaker that will provide a rewardingly immersive impression of actually being at the recorded musical event. 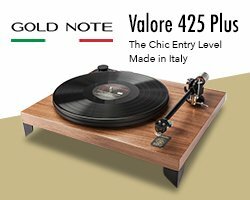 Mix & match with components to suit your tastes and you will be assured of an engrossing and involving musical experience. At their £2500 UK price point I think they are excellent value for money and I strongly recommend an audition! Review system: MBL 116F speakers, Parasound Halo A21 power amp, Bent Audio NOH TVC passive pre-amp and Morgan Audio 500 valve pre-amp. Beresford Bushmaster DAC, Pioneer DV-737 CD transport. Pioneer PL-71 turntable, Zu Audio-modded Denon 103 MC cartridge, Trichord Dino/NCPSU phonostage. Hi Jerry, Just a short message to say thanks for the reviews of both the LFT-8b and LFT-16a. I know you prefer the 16a but I love the 8b and that is surely what hifi is all about- each to their own. Don’t forget to take the pills for the Depeche Mode addiction that is sure to set in after my visits! All the best to you and the other Hifi Pig reviewers. Great review, thanks. I have had the 8b for a while now and agree with pretty much all you’ve described. About the first impression of un-involving sound; try putting the tweeters to the outside instead of toeing them out. They also sound best with 100+ wpc and cranked a bit! I am now planning on purchasing the 16a based on your review and my experience with the LFT-8b. Hi, this was a nice review of the LFT8bs. I have owned mine for about 3 years now and have not look back. These speakers are not perfect like nothing is, but for the price and great frequency range they are hard to beat. I use mine in the highest setting of tweeter, but you have to have good power because they are not so efficient at 84db to get the most from them allowing them to sing like a Lark. Also, good cabling will get you the sparkle at the top. I recommend the silver arrows ics. from Great Britain. Now, the most important tweak I can recommend to improve on the efficiency is if you are using spade connectors to the speaker post is to get some binding post washers and also some small o-ring washers for the spade leads from the panel. The signal will be direct coupled allowing for more effiecient sound. This tweak eliminates the loss of signal to the tightening knobs on the posts. Vibration will also be eliminated too which is very important in obtaining a more clearer sound.. The washers may be obtain online from Herbies Audio lab. The cost is about $15.00/speaker. If you are using Bananas you are already direct coupled but not vibration free. After doing this tweak I can drive them effortless with my Cayin At50 tube amp at 16 watts/rail….Thanks! ….There are those who listen, then there are those who listen well….. The lack of sparkle described in the review did make me wonder whether the treble units were working properly? 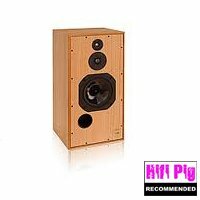 There was a review a while back which identified faulty lft 16a speakers, with frequency response issues. We’re you able to measure the freq response? If I’m honest thats one of the reasons why I haven’t ordered a pair of these already – well that and limited funds at the moment.